For the 2015 Belgian film, see The Ardennes (film). The Ardennes (/ɑːrˈdɛn/; French: L'Ardenne; Walloon: L'Årdene; Luxembourgish: Ardennen; also known as Ardennes Forest) is a region of extensive forests, rough terrain, rolling hills and ridges formed by the geological features of the Ardennes mountain range and the Moselle and Meuse River basins. Geologically, the range is a western extension of the Eifel and both were raised during the Givetian age of the Devonian (387.7 to 382.7 million years ago) as were several other named ranges of the same greater range. Primarily in Belgium and Luxembourg, but stretching into Germany and France (lending its name to the Ardennes department and the former Champagne-Ardenne region), and geologically into the Eifel—the eastern extension of the Ardennes Forest into Bitburg-Prüm, Germany, most of the Ardennes proper consists of southeastern Wallonia, the southern and more rural part of the Kingdom of Belgium (away from the coastal plain but encompassing over half of the kingdom's total area). The eastern part of the Ardennes forms the northernmost third of the Grand Duchy of Luxembourg, also called "Oesling" (Luxembourgish: Éislek), and on the southeast the Eifel region continues into Rhineland-Palatinate (German state). 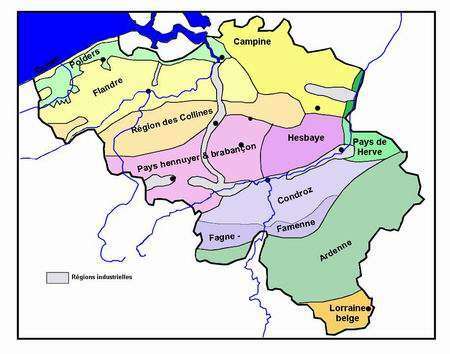 The trees and rivers of the Ardennes provided the underlying charcoal industry assets that enabled the great industrial period of Wallonia in the 18th and 19th centuries, when it was arguably the second great industrial region of the world, after England. The greater region maintained an industrial eminence into the 20th century after coal replaced charcoal in metallurgy. Allied generals in World War II felt the region was impenetrable to massed vehicular traffic and especially armor, so the area was effectively "all but undefended" during the war, leading to the German Army twice using the region as an invasion route into Northern France and Southern Belgium via Luxembourg in the Battle of France and the later Battle of the Bulge. 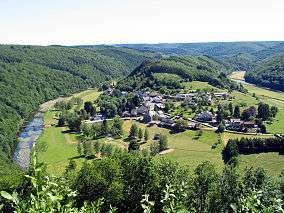 Much of the Ardennes is covered in dense forests, with the mountains averaging around 350–400 m (1,150–1,310 ft) in height but rising to over 694 m (2,277 ft) in the boggy moors of the Hautes Fagnes (Hohes Venn) region of south-eastern Belgium. The region is typified by steep-sided valleys carved by swift-flowing rivers, the most prominent of which is the Meuse. Its most populous cities are Verviers in Belgium and Charleville-Mézières in France, both exceeding 50,000 inhabitants. The Ardennes is otherwise relatively sparsely populated, with few of the cities exceeding 10,000 inhabitants with a few exceptions like Eupen or Bastogne. 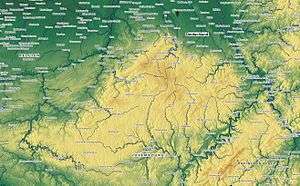 The Ardennes is an old mountain formed during the Hercynian orogeny; in France similar formations are the Armorican Massif, the Massif Central, and the Vosges. The low interior of such old mountains often contain coal, plus iron, zinc and other metals in the sub-soil. This geologic fact explains the greatest part of the geography of Wallonia and its history. In the North and West of the Ardennes lie the valleys of the Sambre and Meuse rivers, forming an arc (Sillon industriel) going across the most industrial provinces of Wallonia, for example Hainaut, along the river Haine (the etymology of Hainaut); the Borinage, the Centre and Charleroi along the river Sambre; Liège along the river Meuse. Rock Bayard of Dinant, on the right bank of the Meuse River. In one legend, a magic horse jumped from the top of this rock to the left bank of the river, carrying the Quatre Fils Aymon fleeing Charlemagne. 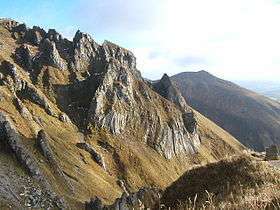 The region took its name from the ancient Silva, a vast forest in Roman times called Arduenna Silva, where arduenna may represent a Gallic cognate of Latin arduus (high, steep). The modern Ardennes covers a much smaller area. In the 20th century the Ardennes was widely thought unsuitable for large-scale military operations, due to its difficult terrain and narrow lines of communications. 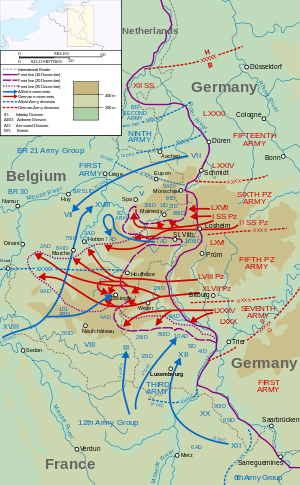 However, in both World War I and World War II, Germany successfully gambled on making a rapid passage through the Ardennes to attack a relatively lightly defended part of France. The Ardennes became the site of three major battles during the world wars – the Battle of the Ardennes (August 1914) in World War I, and the Battle of France (1940) and the Battle of the Bulge (1944-1945) in World War II. Many of the towns of the region suffered severe damage during the two world wars. The Battle of the Ardennes (1914) was the second of the Battles of the Frontiers, After the advancing German left wing defeated French forces in Lorraine, France launched another attack just north of Lorrane, advancing temporarily into the Ardennes. Through strenuous maneuvering and planning, the military strategists of Nazi Germany in 1939 and 1940 selected the forest as the primary route of their mechanized forces in the Invasion of France. The forest's great size could conceal the armoured divisions, and because the French did not suspect that the Germans would make such a risky move, they did not consider a breakthrough there. German forces, primarily under the command of Erich von Manstein, carried out the plan, and managed to slip numerous divisions past the Maginot Line to attack France. This event is frequently considered one of the greatest large-scale armoured movements in history. In May 1940 the German army crossed the Meuse, despite the resistance of the French army. Under the command of General Heinz Guderian, the German armoured divisions crossed the river at Dinant and at Sedan, France. 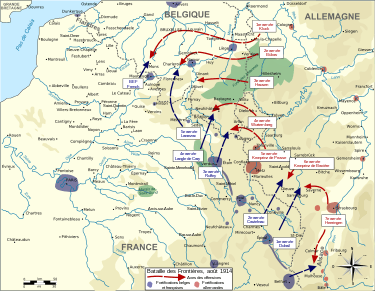 Battle of France (1940) The Germans execute Erich Von Manstein's plan for Fall Gelb. Armoured divisions cross the Meuse (16 May), (principally in Dinant) and Sedan and the Ardennes. The latter region is just at the east of the red shading which marks the extent of the German advance. On 16 May General Maurice Gamelin said he could no longer protect Paris because he had lost the Ardennes. ↑ The defining stratotype for the geological period is an outcropping in Givet in the Ardennes. ↑ Frieser, Karl (2005). The Blitzkrieg Legend. Annapolis, MD: Naval Institute Press. pp. 100–197.